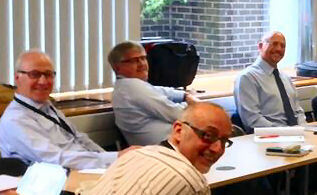 Mike Bull (far right), Technical & Product Development Director of Hope Construction Materials, was given a warm welcome by members at the association’s AGM on 22 July 2015 held at E.ON’s Ratcliffe Power Station as Hope join as an Associate Member. and aggregates and uses ash in several of their products. and Marketing Committees will only serve to strengthen the UKQAA team. This entry was posted in News on July 30, 2015 by admin.